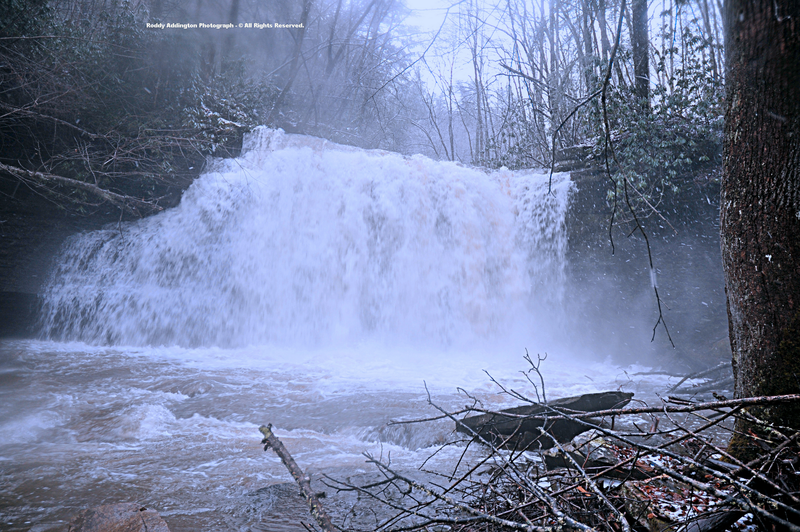 A gushing torrent of furious whitewater drained the rugged expanse of Little Stony Basin during March 6 following the third major storm system in 11 days to impact the High Knob Massif. Wow! It was a wild & wooly time as photographer Roddy Addington braved elements of wind, snow, cold, and the awesome ROAR of raging Little Stony Creek to capture a water level view of the Big Falls! Needless to say, these were less than ideal conditions for photography as a heavy vapor of spray generated thick, misty fog near creek level amid increasingly cold air above warmer water. 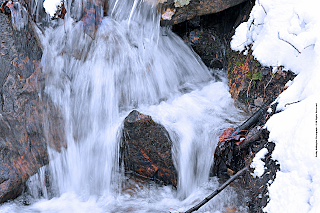 A product of relatively WARM rainfall only a few hours removed from this swirling snow, the gushing torrent of Little Stony Creek actually kept air temps a little milder in the gorge, which plunges to the Clinch River, such that less snow stuck near the water on this morning. Amazing! 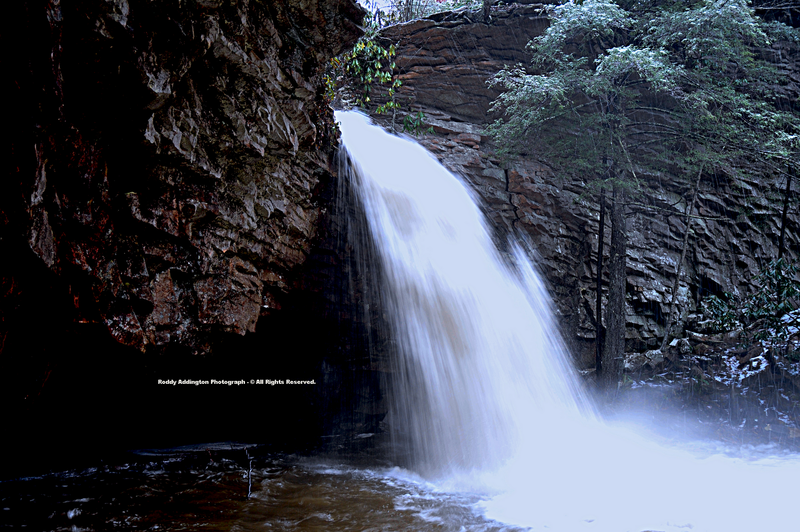 Located near the southeastern edge of the High Knob Massif, more than 2000 vertical feet lower than the peak of its high country, the location of Little Stony Gorge also placed it within significant downslope flow as blustery NW winds travel more than 12 air miles across lofty terrain to reach the gorge. 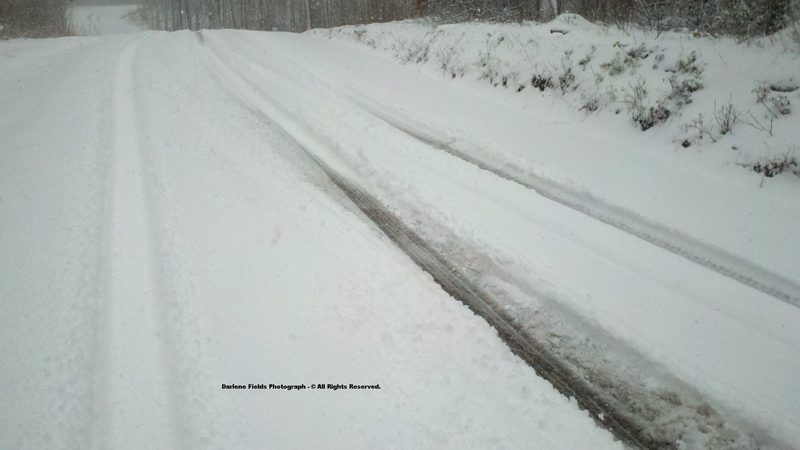 Near the head of Little Stony Basin, it was like a different world as half a foot of wet snow fell upon the High Chaparral community during the morning ( 4" on road in above picture by 9 AM ). Joe & Darlene Fields measured up to 6.5" of snow depth by 11:30 AM, as light snow continued to fall into the afternoon ( 6" mean ground depth ). 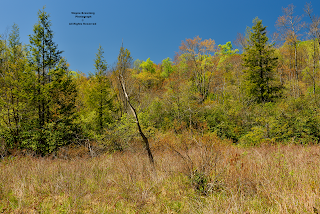 High Chaparral rests 4.0 air miles east of High Knob, 923 vertical feet lower than its peak, between Burns Creek of the Guest River and Little Stony Creek ( both draining into the Clinch River ). The way this snow rapidly stuck to roadways following more than 2.00" of drenching rainfall was impressive, even for the high country! One reason snow stuck so rapidly was the size of morning snowflakes, which were outrageously large. 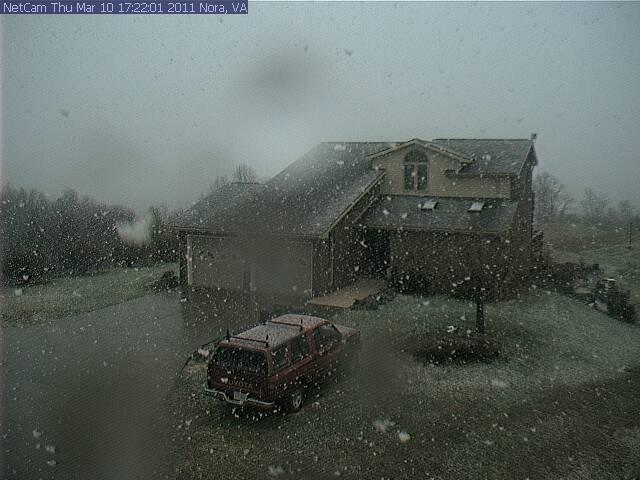 I mean HUGE flakes that rivaled some documented during the great MEGA-Dump of December 2009 and the Snow BLITZ of January 1998. Roddy found similar conditions in Chestnut Flats of the main crest zone, where half a foot of snow was on the ground and State Route 619 was well covered as snow continued to pour! An interesting observation made by Roddy was that trees were snow plastered and covered by snow only up so high in elevation, above which they held little snow on the morning of March 6. 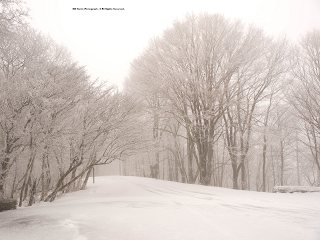 This being in direct contrast to later on March 6 into March 7, when trees became heavily coated in whiteness by RIME formation as they extracted cloud vapor from icy, cold air across a large vertical elevation range of the High Knob Massif ( heaviest riming being generally at higher elevations ). 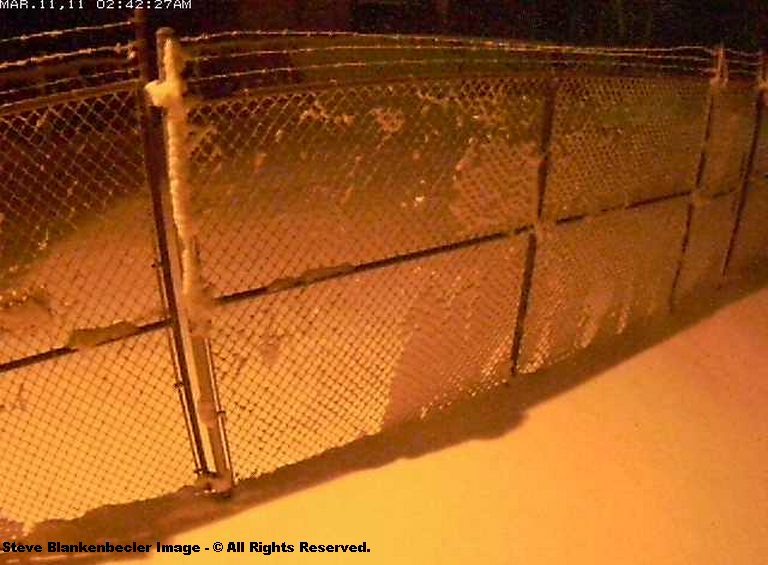 The difference observed above being due to direct transition from heavy rain to heavy snow during the 4 AM to 7 AM period of March 6. 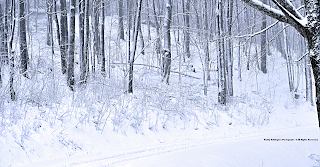 RIME simply did not have time to form, with strong winds acting to blow much of the snow off trees at high elevations to generate the contrast with heavily snow covered trees in hollows protected from wind. 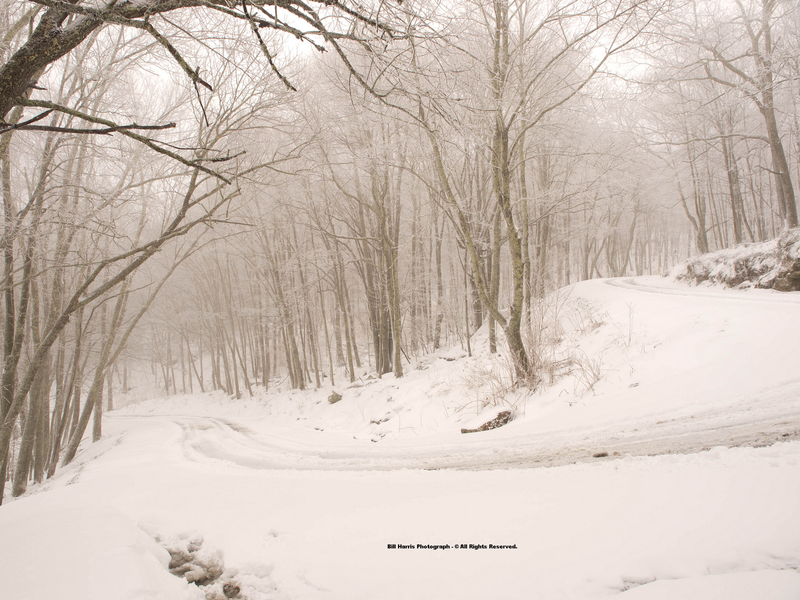 So instead of ascending into an increasingly white world of trees, as is so often the case on High Knob, it was just opposite during morning hours of March 6 when snow, not rime, was the culprit. 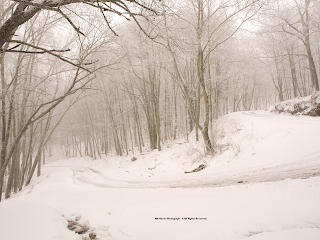 Photographer Bill Harris offers a gorgeous set of photographs to illustrate the nature of changing conditions during afternoon hours of March 6 in the High Knob Massif. 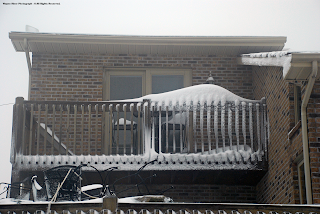 As morning snowfall waned, cloud bases lowered into the afternoon to begin RIME formation in icy, cold air. More light snow did accumulate, with Darlene Fields measuring 0.5" of new snowfall in High Chaparral during the afternoon to push the storm tally to 7.0" at 3300 feet. 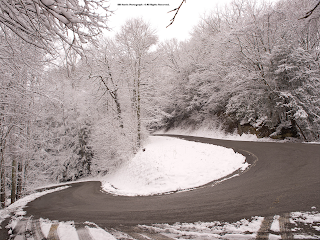 Bill shows the vertical contrast in conditions by taking a few shots along the famous curves of State Route 619 as it turns and twists through rich, mesic northern slopes of the High Knob Massif. the vertical, as is typically the case, with the above scene being close to where Joe Carter measured 4.5" of snowfall at the Norton WP. 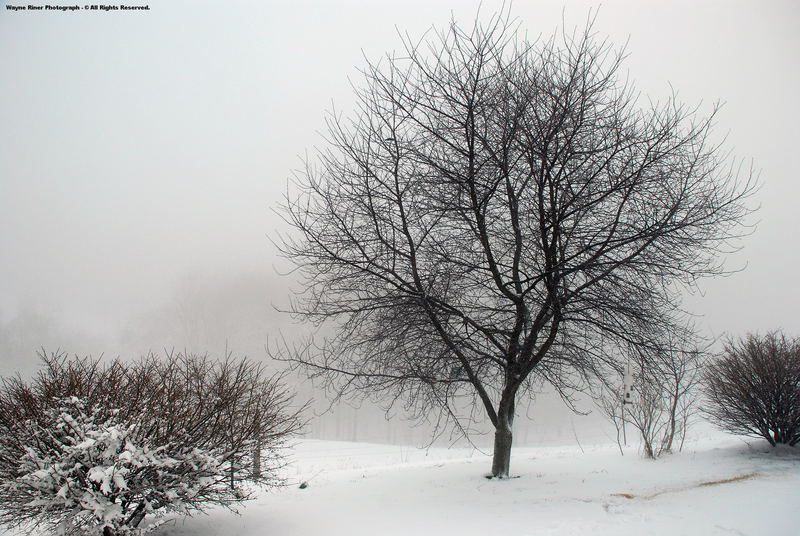 These photographs also show what Roddy reported, with snow laden trees in places sheltered from the wind and hardly any on trees exposed to the wind driven fury of morning snowfall. 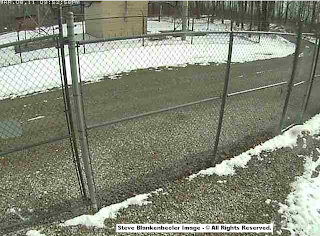 Norton Water Plant: 4.5" to 5.0"
Eagle Knob of High Knob Massif: 7.0-8.0"
This storm event pushed the 2010-11 winter snowfall tally to 100" in High Chaparral and to 126" on Eagle Knob, with 87 days of 1" or deeper snow depth on northern slopes in High Knob Lake Basin. 108" at the summit level of the High Knob Massif, the highest ever observed in Virginia ( it is an unofficial seasonal snowfall average since there is no officially designated NWS cooperative station ). 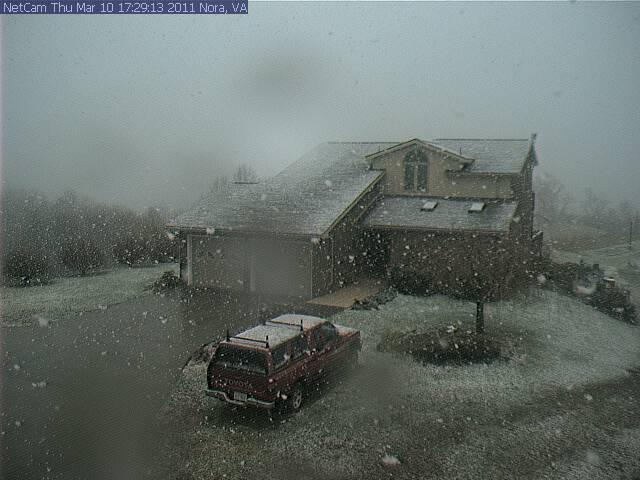 "The Sunday morning rain turned to snow and fog. Soon the tree will be full of white blooms against a bright blue sky ( we hope )!" 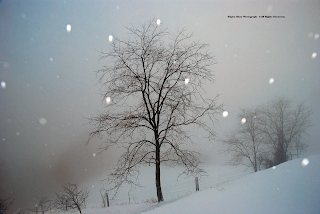 The same type of conditions were observed across the wind swept crest of Long Ridge, with almost all snow blowing off the Cherry Tree in Wayne & Genevie's yard. 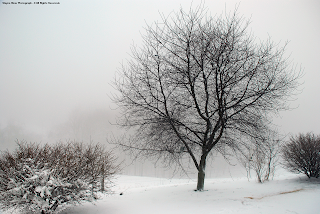 grey fog against the Sunday morning storm." A gorgeous photograph by Wayne illustrating both the size of morning snowflakes and lack of sticking snow on the Locust due to strong winds. "From this high room I hear the wind blowing late at night. On clear days the view is northeast looking over the high ridges. 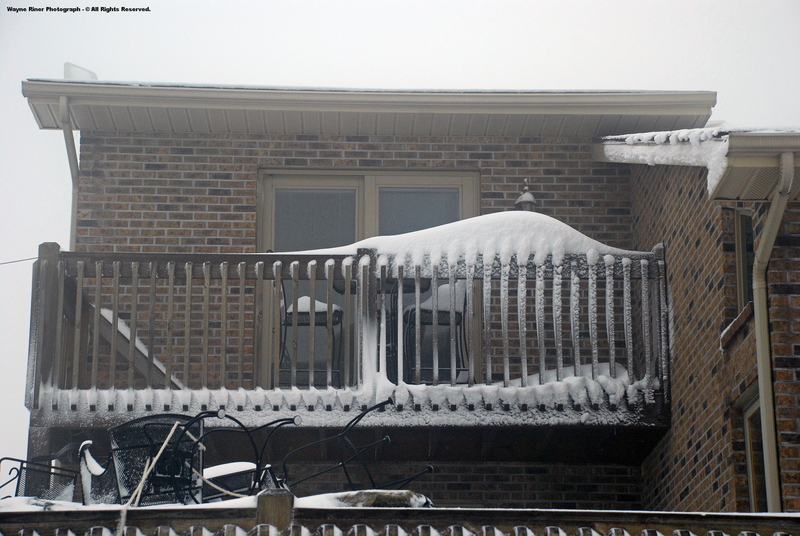 Below, chairs are tied down on top of the hot tub to keep all from blowing to Wakenva." Long Ridge rises steeply above Wakenva Hollow whose union with Honey Branch of McClure Creek is some 950 vertical feet lower than Nora 4 SSE ( Wayne & Geneive's home ). 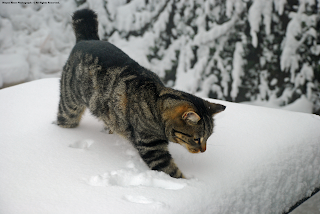 "Surprised by the Sunday morning snow, Bobby our short tailed cat, explores the cold snowy world. After posing for the picture, he runs to the workshop to his box by the warm woodstove." Wayne & Genevie must NOT have given Bobby copies of my Climate Newsletter Outlooks to read from March 4 & March 5. "Cut sandstone rocks from past years serve as a garden bench for us to sit and reflect on the work of summer. The sundial points to the grey north, in the direction of the snow and wind." 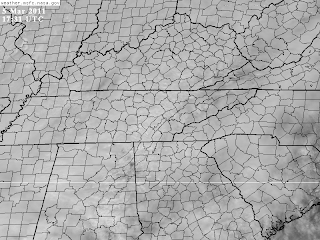 Cloud bases dropped in wake of this furious snowfall to engulf much of the High Knob Massif and Tennessee Valley Divide in an array of thick, low, icy clouds! Air temps remained below freezing from the elevations of Norton & Wise on upward from sunrise throughout the daylight hours of March 6, with readings dropping into the lower-middle 20s above 3000 feet in the High Knob high country. BRRR! While heavy snow was an attention grabber, water is really the most significant factor as yet another major storm system is set to impact the mountain region during March 9-10. 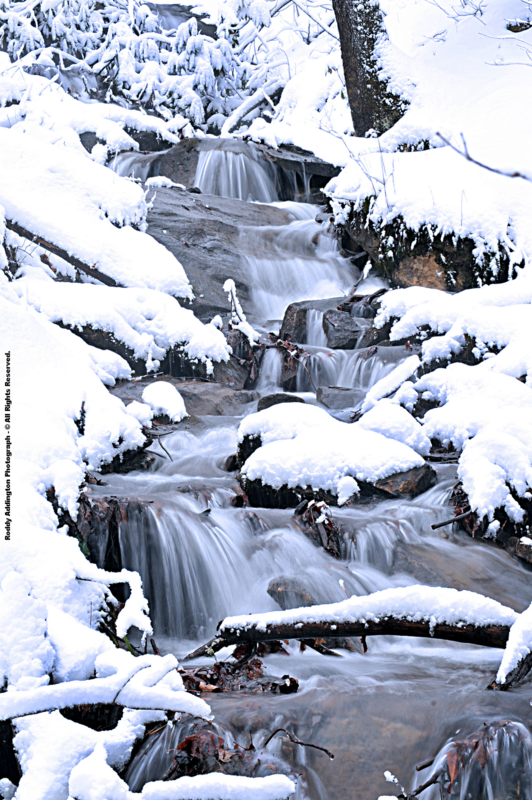 More than 7.00" of total precipitation have accumulated across the High Knob high country during the February 24-March 6 period, amid three major storm systems. Although the High Knob Landform ( HKL ) contains an extensive and extremely well developed system of subterranean conduits ( caves ), to include the 68th longest cave system in the world and the deepest east of the Rockies and north of Mexico in North America, everything possesses its limit. 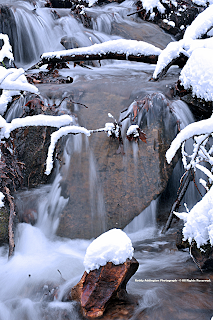 While nearly all major steep creeks draining the remnant high country massif of the HKL have portions which sink into the subterranean, extensive snow cover ( as of early on March 8 ) will have to melt away as the fourth orographic forcing event in two weeks cranks up into March 9. 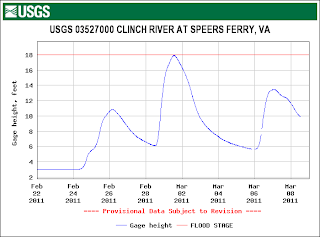 The increasing impact of all this wetness can be seen on the latest hydrograph for the Clinch River, with a much flatter slope through March 7 in the wake of this last event. 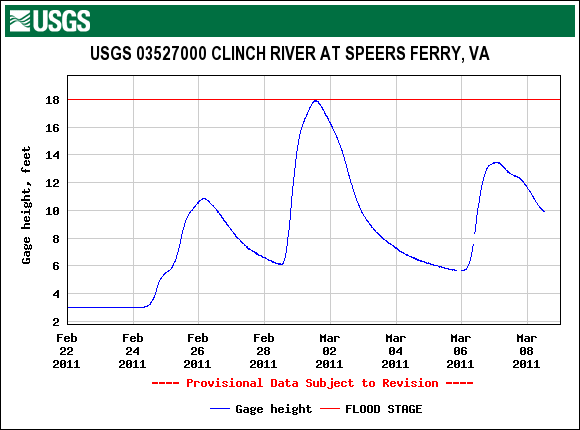 Note that the curve representative of the river level dropped off much more steeply in early March, with the slower drop now indicative of a higher water table feeding the Clinch. Also note that this latest rise was faster ( graph steeper near top ). A higher antecedent precipitation index value will make less rainfall necessary to raise water levels with the March 9-10 event ( subterranean conduit systems throughout the Clinch and Powell basins helping control rises up to a certain point ). Even after more than 100" of snowfall such scenes as captured by Roddy are purely majestic! 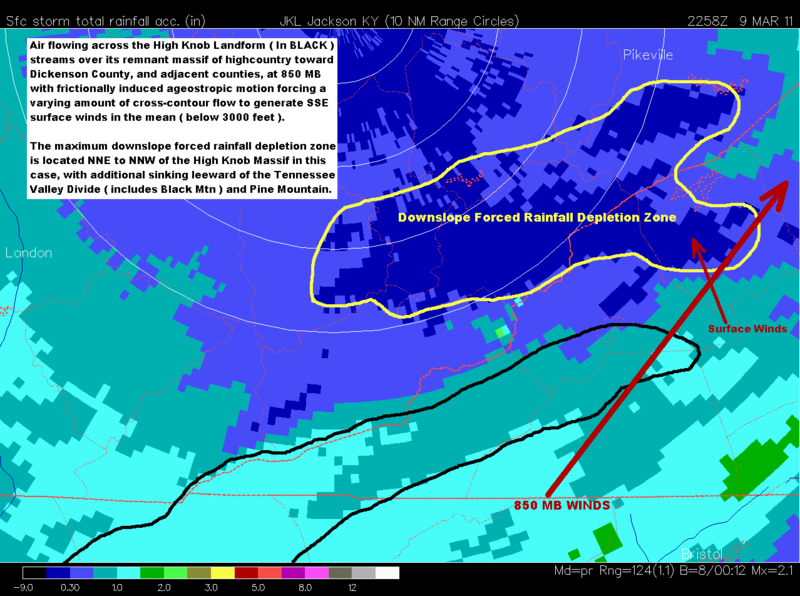 With mean SSE to SSW air flow trajectories from the surface up to 850 mb in the atmosphere, locations north to slightly northeastward of the High Knob Massif were subjected to strongest inverse forcing and lee wave formation. 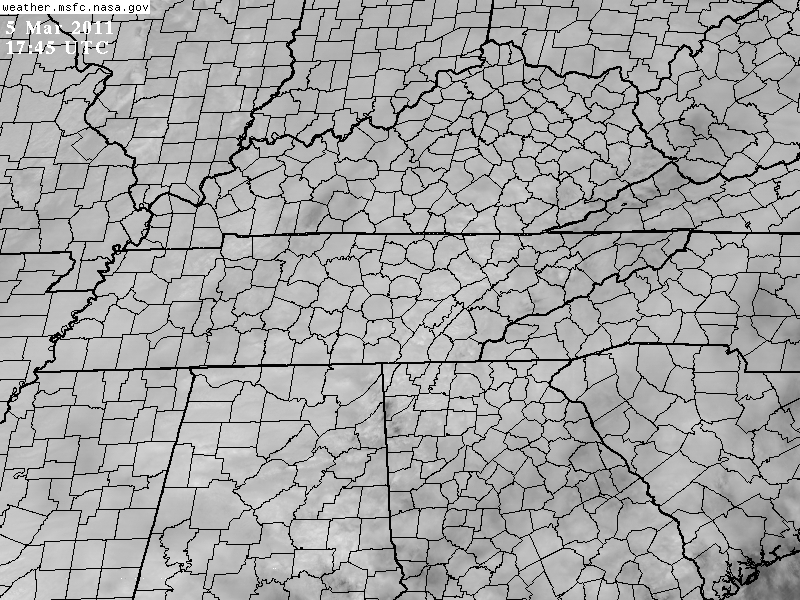 Note the nice lee wave clouds across Wise and Dickenson counties, N to NNE of the High Knob Massif at 12:15 PM March 5, and the waves above Russell County lee of Brumley Mountain. 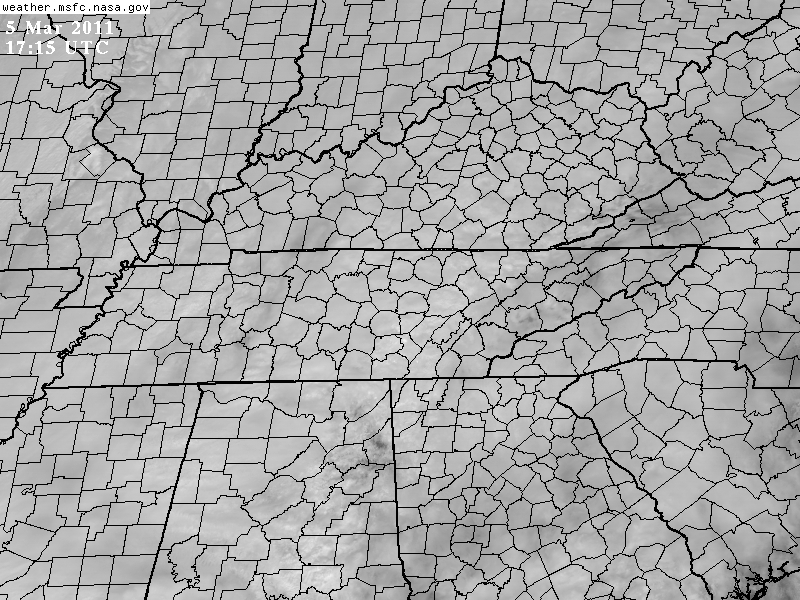 A series of NASA visible satellite images will be shown to illustrate the nature of these mountain waves ( graphically highlighted for the next time ). 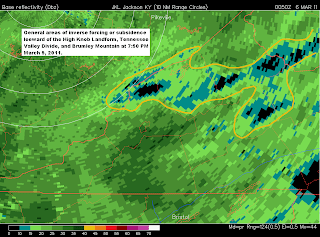 Orographic gravity waves became extremely well defined above Wise & Dickenson counties at 12:45 PM, as strong air flow streamed across the High Knob Massif. To better see the mountain waves above, yellow lines have been drawn through the axes of their troughs, adjacent to each wave crest, for a comparison with the previous image with no lines. 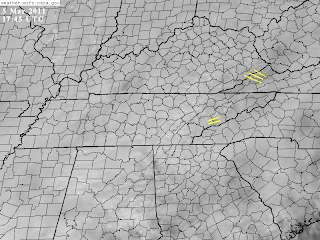 A couple of distinct waves are also located leeward of the Great Smokies, over eastern Tennessee at this time ( more to be highlighted below ). 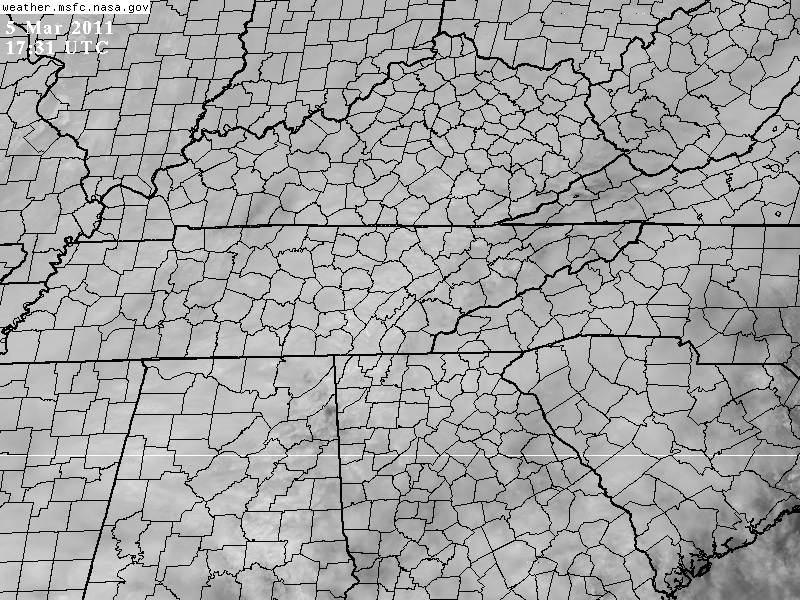 Although vanishing at times beneath higher altitude cloudiness, these orographic waves were present throughout the daylight hours of March 5. Yellow lines again define the trough axes of a series of mountain waves rippling outward from the High Knob Massif, while an area of more chaotic turbulence appears lee of the Great Smokies over east Tennessee ( in yellow circle ). 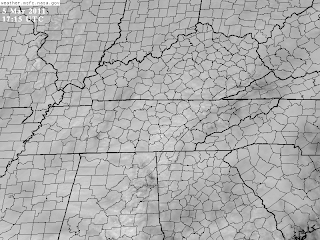 As rain overspread the area in late afternoon and evening hours of March 5, signs of orographic impacts became visible on Doppler imagery above the mountain wave corridor highlighted above on NASA imagery. 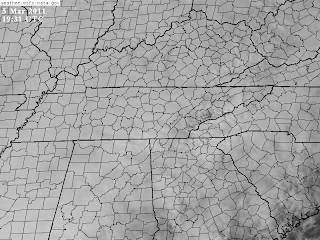 It was interesting to observe inner locations devoid of rain would occasionally take on shapes of a orographic wave or wave axis region in the flow field downstream of the High Knob Massif. [ Downslope flow into the Russell Fork Basin was realized by greatly reduced rainfall amounts, especially through evening hours of March 5. 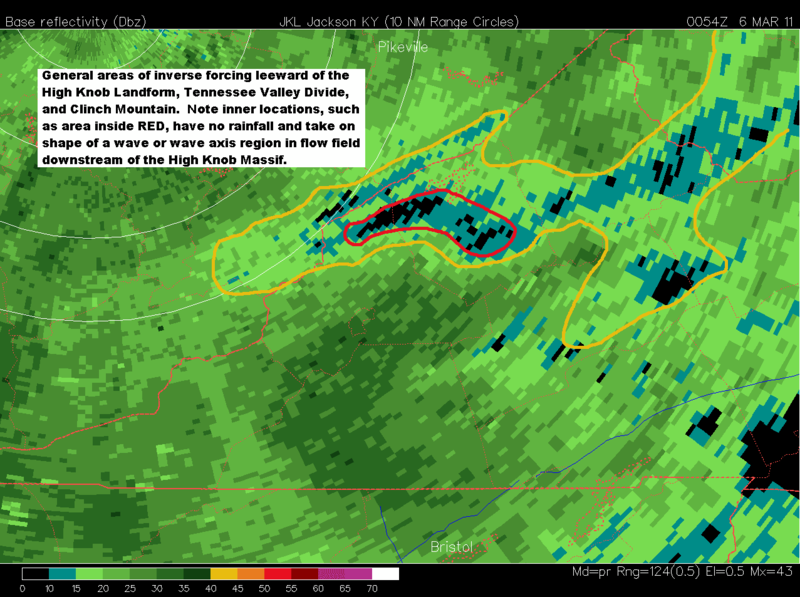 At 9:40 PM, for example, 0.76" of rain had accumulated at Big Cherry Dam of the High Knob Massif, on upsloping, while as little as 0.04" was reported in the Birchleaf community of Dickenson County ( differences increased to more than 1.00" by Midnight ) ]. 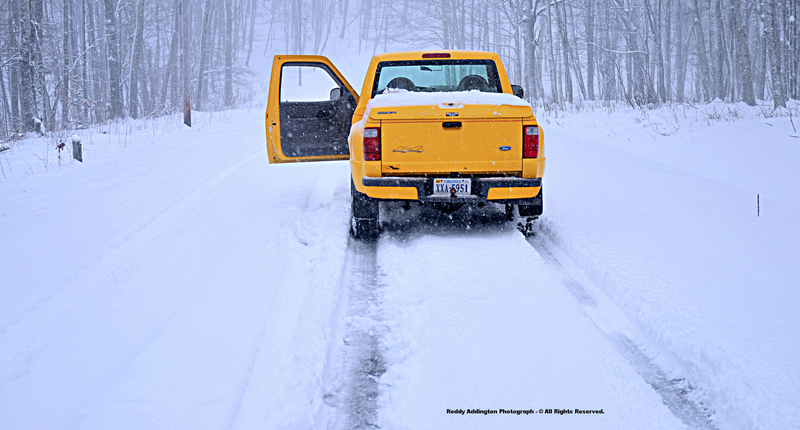 While finally melting off highcountry roads, widespread snow remained on the ground across upper elevations of the High Knob Massif during afternoon hours of March 8 ( up to 6" of snow depth was reported to still be at the summit level by Steve Blankenbecler ). This was a high density snowfall which is always harder to melt away, especially amid cool temperatures made chillier by the snowpack and S-SE upslope flow across the high country. 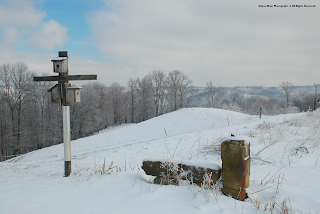 Snow cover has now mostly melted away from lower-middle elevations, but its not been that way long as highlighted in these recent views from my friends Darlene Fields and Wayne Riner. 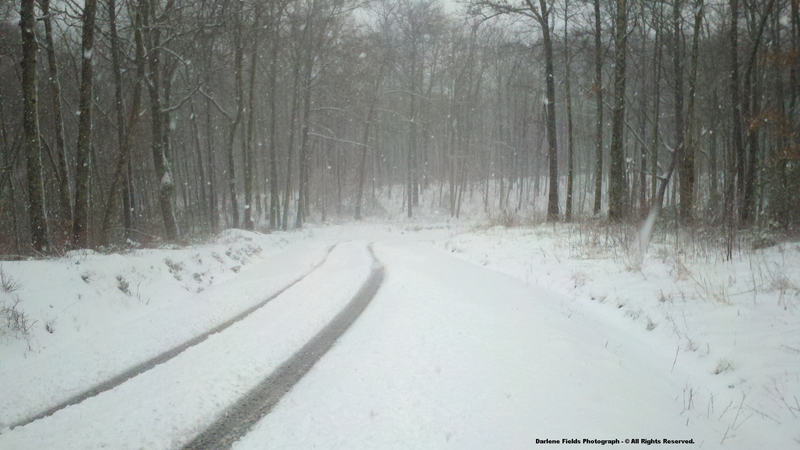 It was a snowy Monday morning commute to work for Darlene Fields, as both trees and ground remained well covered. 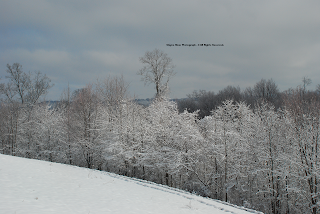 March 7 was a cold day over the snow, with MAX temps that only reached middle to upper 30s from Clintwood to Long Ridge, Norton, and Wise. 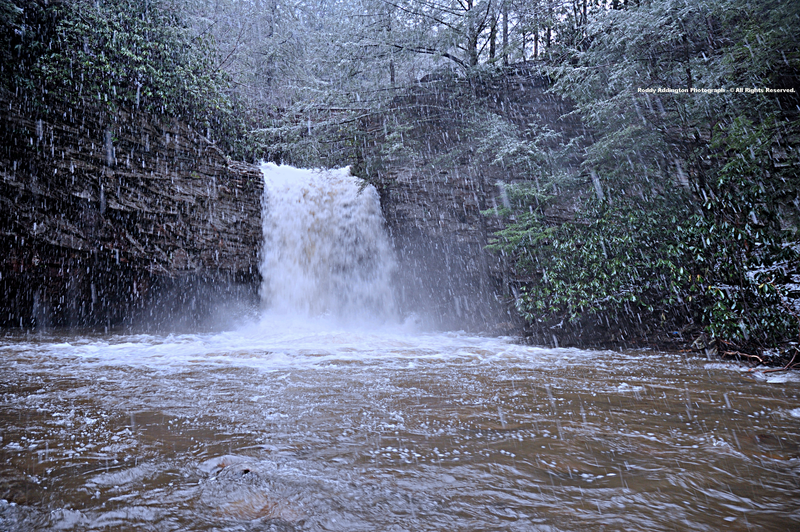 The fourth major storm system in two weeks ended with a heavy, wet dump of snow at the summit level of the High Knob Massif during March 10. 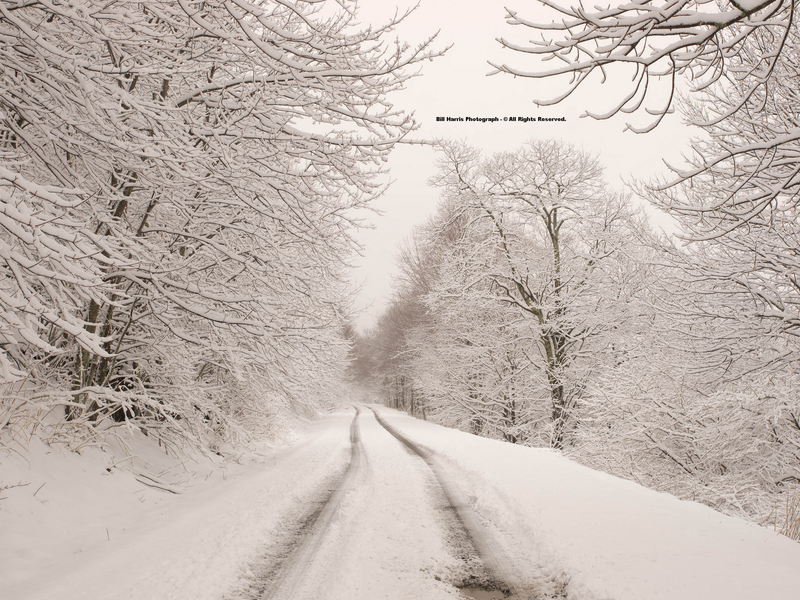 A rapid change from heavy rain to heavy snow occurred above 4000 feet after sunrise, with the transition working down to the 3400 foot level by 9:30 AM. A short while later I received a phone call from James Bolling of Little Mountain, above majestic Big Cherry Lake. Such large snowflakes are often characteristic of a nearly isothermal vertical temperature profile and strong upward motion in the atmosphere. 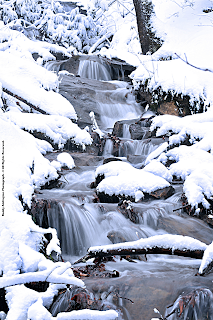 They occurred most recently during the March 6 snow event, and were made famous during such epic storms as the January 1998 Snow BLITZ and the December 2009 MEGA-Dump ( both events dropping more than 3 feet of snow on portions of the High Knob high country ). For a time, at least, it appeared that this was going to get serious into lower elevations as a similar change occurred down to the elevations of Wise and Sandy Ridge by mid-day, as captured in a series of clips by Wayne & Genevie Riner. 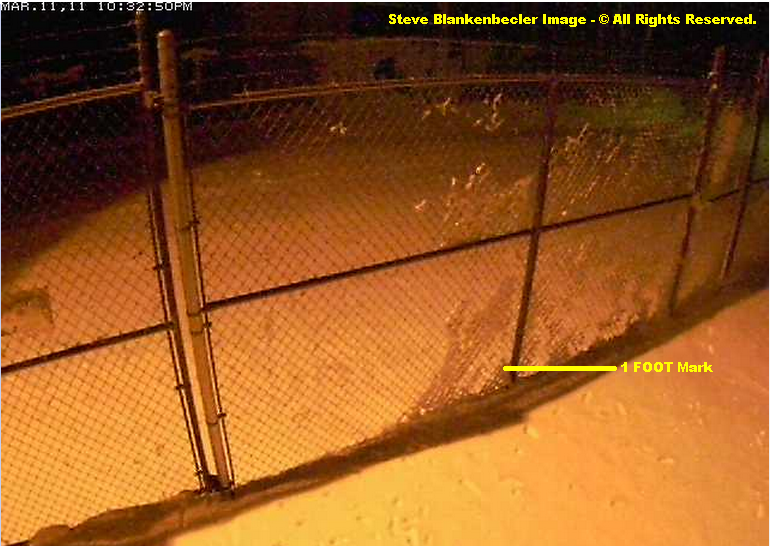 The final image above marked about as much as accumulated during this period, as deep moisture moved northeast just enough to take the area out of heavy snowfall ( only rain fell in low valleys ). 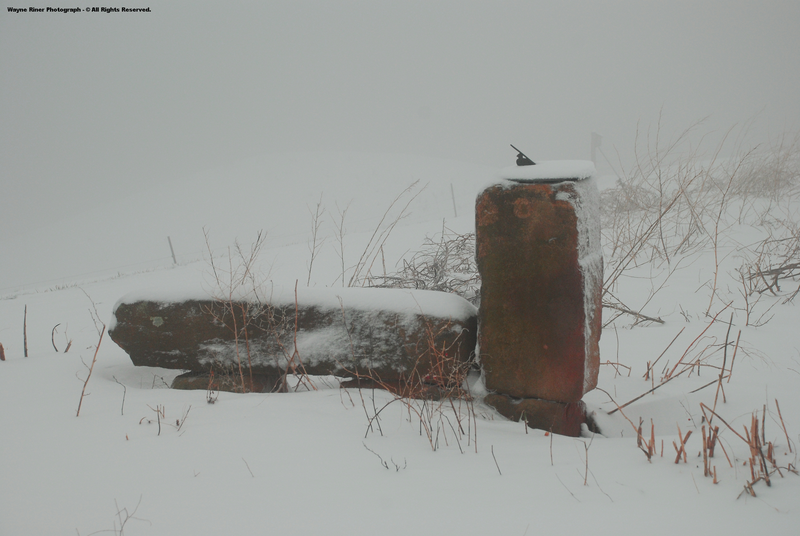 A very close call given the half a foot of snow which had already stuck at the summit level of the High Knob Massif by this time! [ It is interesting to note that the snow in Wise and Nora 4 SSE stuck in most places with air temperatures above freezing. 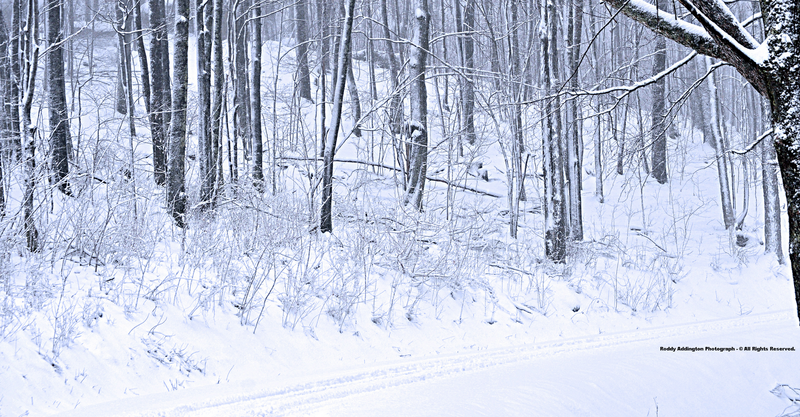 The snow fell so hard, with such big flakes, that it could not melt fast enough to prevent some sticking amid these middle elevations ]. 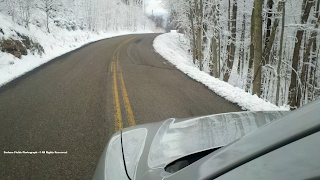 While steady snow fell late on March 10 into the morning of March 11 it remained light, and much less than terrain forecast models had previously predicted on NW upslope flow. This resulted in a interesting and rather significant snowfall gradient in the vertical, with most of the accumulation above 3000 feet as initially expected prior to new models throwing sucker runs ( the atmosphere did try to take snow levels lower, as above images illustrate, but ran out of gas before getting the job done! ). Most of this vertical difference developed during the morning of March 10, when 5" to 7" dumped upon highest elevations in the High Knob Massif with decreases to 2" or less below 3000 feet. Generally no accumulation occurred during the daylight hours of March 10 below 2500 feet, with a general 1" to 2" of new snow falling above 2000-2500 feet in elevation into the morning of March 11. This left many valleys and ridges in lower elevations with only a dusting to less than 1". 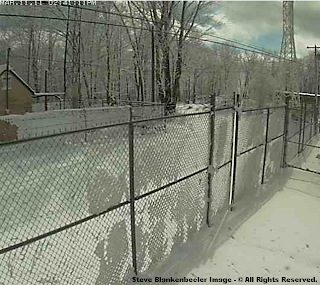 Rime remained on trees in upper elevations as partial sunshine returned into afternoon hours of March 11. Note deep snow on the leeside of the building roof across the road. 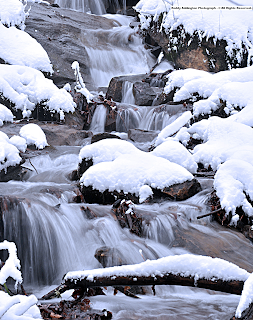 This high density snowpack did not settle and melt much during the day, with temps in the 20s to lower 30s on Eagle Knob and across upper north slopes above 3500 feet. 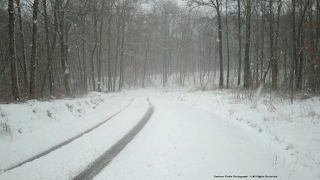 This event will push the snow depth count to 91 days ( 13 weeks ) of 1" or greater depths for northern exposed slopes in lofty High Knob Lake Basin by March 12 ( during the 2010-11 winter season ). [ While significant melting is expected during the next 24-48 hours on warm air advection, a late weekend cooling trend will likely hold some snow on favored northern exposed slopes into next week. Snow was actually still on these slopes, at least in patches, when this new fall began on March 10 ]. Another important aspect of this recent storm was extreme wind gusts along and to the leeside of higher mountain ridges. 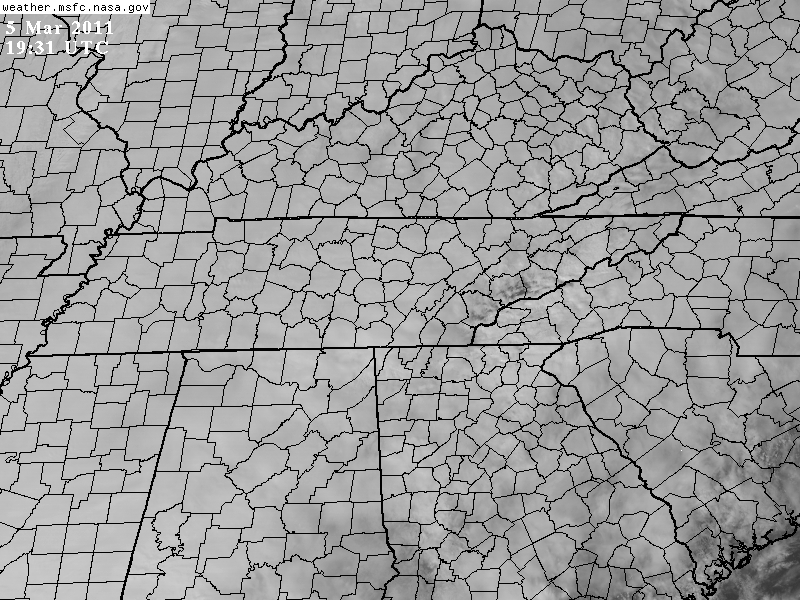 Unfortunately, due to extensive high altitude cloudiness, it was not possible to see on NASA imagery the orographic gravity waves that generated many of these extreme wind gusts. 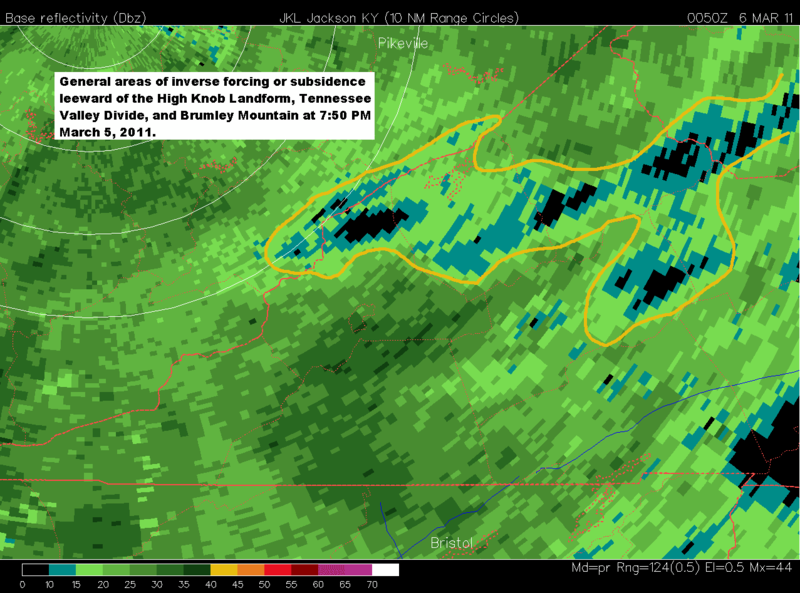 James Bolling reported numerous trees downed in the High Knob Massif, with several across State Route 619 and Forest Service 237. 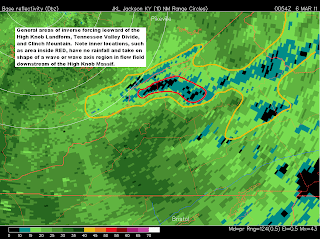 Strong winds produced another significant upslope-downslope couplet across the High Knob Landform, as orographic forcing with upsloping into windward slopes gave way to compensative inverse forcing with downsloping into leeside locations generating a rainfall depletion zone. The above, of course, was only Phase 1 of this complex system, with much more rain and elevation snow falling into March 10-11 to boost March 1-11 precip totals into the 6.00" to 7.00"+ range across the High Knob high country. 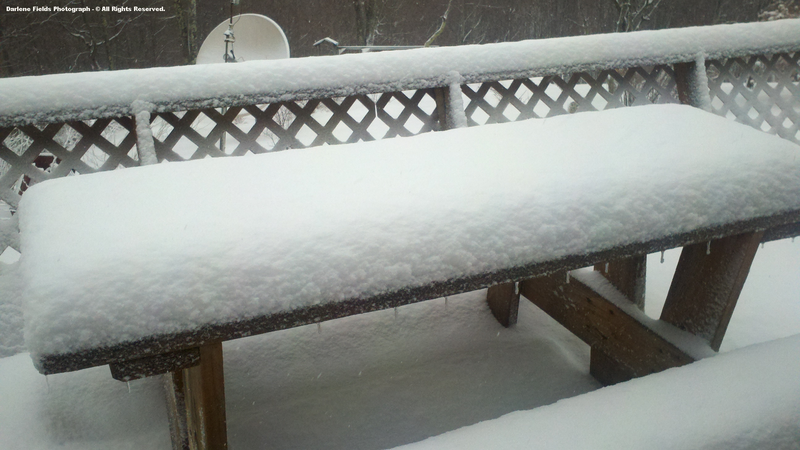 what the second half of March 2011 brings?